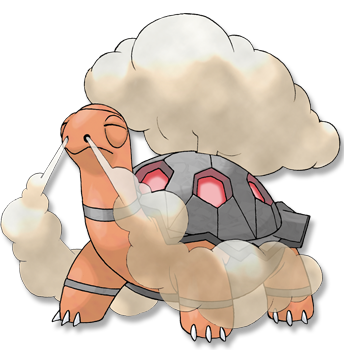 White Smoke Prevents the Pok�mon's stats from being lowered. This Pokemon's stats cannot be lowered. Shell Armor* The Pok�mon is protected against critical hits. No moves will critically hit this Pokemon. Ruby/Sapphire TORKOAL generates energy by burning coal. It grows weaker as the fire dies down. When it is preparing for battle, this POK�MON burns more coal. Emerald It battles using energy it gets from burning coal. When loosing smoke from its nostrils, it lets off a sound that is similar to a locomotive�s horn. FireRed It burns coal inside its shell. If it is attacked, it belches thick, black smoke and flees. Leaf Green It burns coal inside its shell. If it is attacked, it belches thick, black smoke and flees. Diamond/Pearl It burns coal inside its shell for energy. It blows out black soot if it is endangered. Platinum It burns coal inside its shell for energy. It blows out black soot if it is endangered. Heart Gold You find abandoned coal mines full of them. They dig tirelessly in search of coal. Soul Silver You find abandoned coal mines full of them. They dig tirelessly in search of coal. Black It burns coal inside its shell for energy. It blows out black soot if it is endangered. White It burns coal inside its shell for energy. It blows out black soot if it is endangered.